An extremely spacious, detached 3 bedroom villa, with many unique “Manrique style” features, situated on a large plot, in an elevated position with impressive panoramic views over the centre of Playa Blanca and across to the islands of Los Lobos and Fuerteventura. The entrance hall leads to a central covered atrium used as a dining room, with natural light coming from above. All rooms within the property can be accessed from this central area. The lounge area is bright and airy and is split into two sections, with a cathedral ceiling and patio doors leading onto the extensive outside terrace. There is a large, fully ﬁtted and equipped kitchen with a breakfast room attached, and an adjoining store room and enclosed area for drying laundry. The large master bedroom also has an area for seating or exercise equipment, and has patio doors to another terrace. There is a walk-in dressing room, and a separate room with double vanity washbasins. The master bathroom is completely private and has a sunken corner bath surrounded by picture windows, giving amazing views over Playa Blanca and the Atlantic Ocean. There are two further double bedrooms, with ﬁtted wardrobes and en-suite bathrooms, and a separate guest cloakroom. The villa has a gated driveway leading to detached garage, allowing parking for several vehicles. An extensive covered terrace, with volcanic stone arches, overlooks mature palms and shrubs in the large enclosed garden. A gate gives direct access to the community swimming pool. 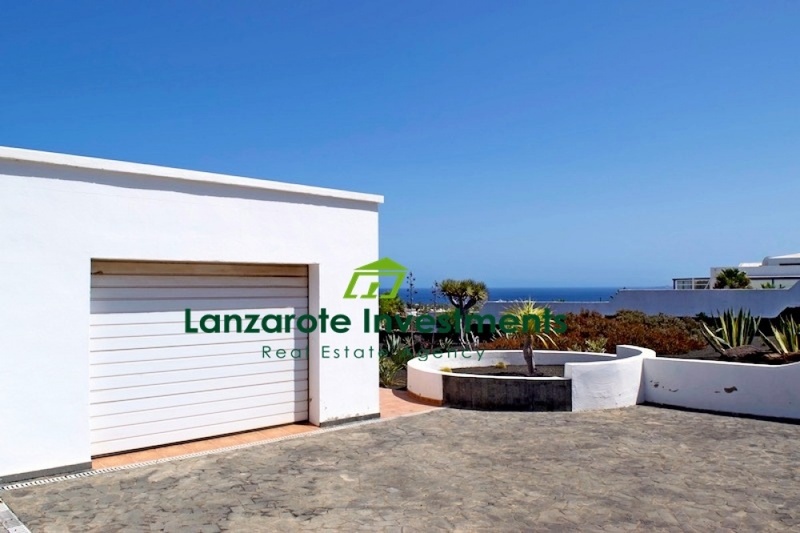 The property has an alarm system installed, wooden shutters on all windows, and is being sold fully furnished.